Pedestrians take a mid-afternoon stroll downtown past the vacant building at 831 Grand Ave. The historic building most recently housed Colorado Mountain College Central Services but has been vacant for the last six or seven years. A piece of property in downtown Glenwood Springs known by locals and historians alike as the old McCoy Armory Building, and which recently became entangled among the holdings of the now-bankrupt Woodbridge Group, has sold to a Basalt investor. It sold last month for $1.1 million to Discovery Place Investments Ltd., confirmed William Small with Zenith Realty Advisors. “The property was what I think was in pretty good condition, but it hadn’t been used for (several years),” he said. Colorado Mountain College was the last occupant of the building at 831 Grand Ave., at the northwest corner of Ninth and Grand. After the college moved its headquarters across the street and down the block to its current location at 802 Grand in 2011, the structure has been unoccupied. 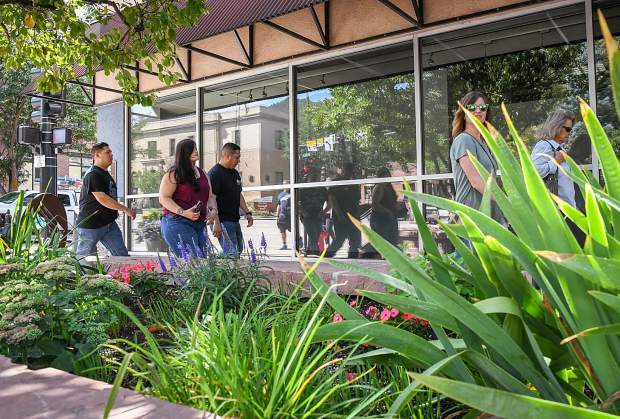 According to Garfield County Assessor records, the property sold Aug. 27, with the seller listed as Topchord Investments LLC and the buyer Discovery Place Investments Ltd., which lists a P.O. box in Basalt. Topchord bought the building from CMC in August 2014 for $1.2 million. Discovery Place Investments representative Warwick Mowbray told the Glenwood Springs Post Independent that he was still getting to know and slowly becoming more comfortable with the historic piece of property, and said that it would take some time before any specific plans would be disclosed. Mowbray did say, though, that the tentative plan for the property was for retail space to occupy the bottom floor and office space on the second floor. Small indicated he didn’t think a major redo of the building was in the works. “Not only did (Discovery Place Investments) get the building, but the parking lot behind that,” he said. The downtown Glenwood Springs property had been among several commercial properties owned by Woodbridge affiliates throughout the Roaring Fork Valley, before the company declared bankruptcy late last year amid an investigation by the federal Securities and Exchange Commission (SEC) over fraud charges. The SEC has claimed that investors were cheated out of $1.2 billion through a Ponzi scheme orchestrated by former Woodbridge CEO Robert Shapiro, an Aspen Glen resident at the time who stands accused of living a lavish lifestyle through the proceeds. Shapiro resigned from Woodbridge in December 2017. He has denied the charges. In addition to numerous high-end residential properties stretching from Carbondale to Aspen and held under various limited liability company affiliates of Shapiro and Woodbridge, the company also owned several commercial properties. The CMC building in Glenwood had been advertised for $1.2 million last spring. Glenwood Springs’ historical records depict structures on the corner lot dating back to 1888. However, in 1913, J.F. McCoy constructed his building on the site, which the state of Colorado purchased in 1917 for the National Armory. Historical records also detail how the second floor of the former McCoy Armory Building served, at one point or another, as a ballroom, bowling alley and even a rollerskating rink. As to when the newly acquired building will reopen its doors to new commercial activity, that remains in question.